Frostburg State University’s Department of Music will present the String Duo and Guitar Showcase Concert on Wednesday, Nov. 14, at 7:30 p.m. in the Pealer Recital Hall of FSU’s Woodward D. Pealer Performing Arts Center. This event is free and open to the public. 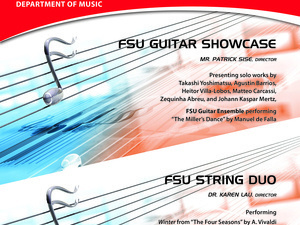 The FSU String Duo, directed by Dr. Karen Lau, will feature Maggie Malat on cello and Elijah Jones on double bass. They will perform “Menuet” from “Royal Fireworks Suite” by George Frideric Handel, “Et la lumière fut (Le temps revient)” by Werner De Bleser and “Winter” from “The Four Seasons” by Antonio Vivaldi. The duo will be joined by Paul Zimmerman on guitar for “Winter. The Guitar Showcase, directed by Patrick Sise, features the Guitar Ensemble, which is made up of Daniel Bedwell, Marshall Borleis, Nate Richards, Corey Snowden, Grant Stryckning, Zimmerman and Zou Haoran. The selections will include “Chôros No. 1” by Heitor Villa-Lobos, performed by Stryckning; “Etude No. 4” by Matteo Carcassi, performed by Richards; “Romance for Tree” by Takashi Yoshimatsu, performed by Borleis; “Tarantella, Op. 13, No. 13” by Johann Kaspar Mertz, performed by Bedwell; “Tico-Tico no Fubá” by Zequinha de Abreu performed by Snowdon; “Vals, Op. 8, No. 3” by Agustín Barrios, performed by Zimmerman; and “The Miller’s Dance” by Manuel de Falla, a performance by the entire ensemble.